Downloading and installing media files or apps from unknown sources on your Android smartphone poses great risks. There are thousands of infected and malicious apps that can compromise your privacy, personal data or classified files that shouldn’t be accessed by unauthorized users. The good news is that a good antivirus app can help protect your device from most of these threats. Google PlayStore is the safest place to download the best antivirus for android since most of them have real reviews from previous users. However, there are many apps to choose from and it can be quite challenging to determine one that will work perfectly for your android device. Fortunately for you, we handpicked the top android antivirus apps that will protect your personal data as well as your privacy. Here are some of the best antivirus for android that you can download from the Google PlayStore. Kaspersky has been trending as the best PC Antivirus of all time with powerful security features. 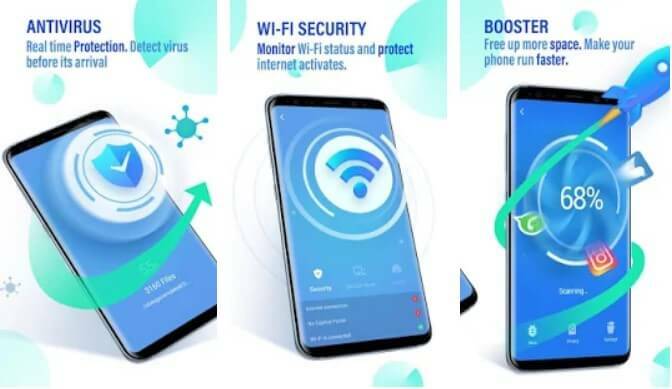 It is also the best Antivirus for Android as it makes good use of its unique features and capabilities to secure your personal data. It comes in two versions; the free version and the paid subscription. You can start out with the free version to determine if Kaspersky Internet Security is the best for you before you. However, if you choose to upgrade to the yearly subscription, then you get more solid features such as anti-phishing, cloud-based protection, and real-time protection. The most interesting part about the paid subscription is that it comes with a license for two Android devices. 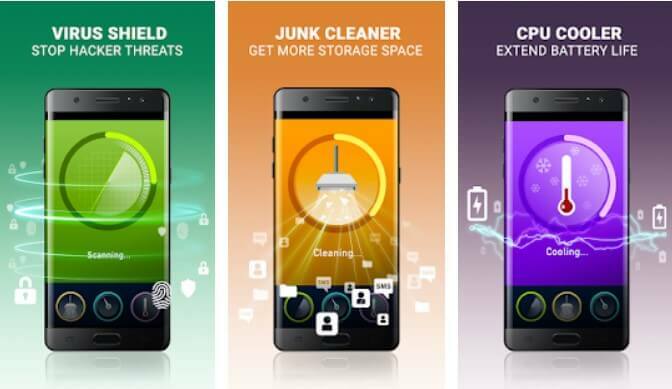 Bit Defender Android security app comes with robust privacy-protection tools and a nearly flawless malware protection. Its anti-theft features are incorporated in Android Wear watches and it is available in both the free and paid versions making it the best android antivirus. The free version only scans for malware while the paid version offers other incredible features that guarantee solid protection and restricted access to personal data. It has the unique ability to fight against malware and other potential viruses from malicious websites and infected apps. Bit Defender works well on android 2.0.1 and above and offers a great performance when it comes to your mobile security. This antivirus app comes with an extensive set of features and options that can be enjoyed by Android users at no cost. It highly rated on Google PlayStore because of its great security engine that is powered by both cloud and local engines. CM Security works pretty first when it comes to performing scans and removing viruses and malware. Its app lock and vault features offer the best user experience as they protect your private apps from people who like invading your privacy. It is also the best free antivirus for android as you can easily download it from the Google Play Store. 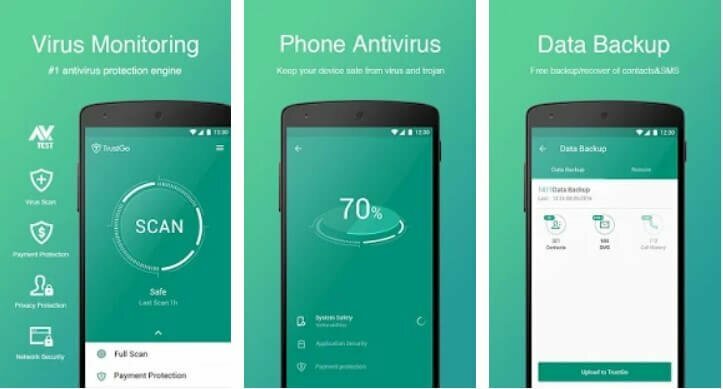 If you have been looking for the best free antivirus for android with proven protection, then AVG will be one of the best security apps for you. 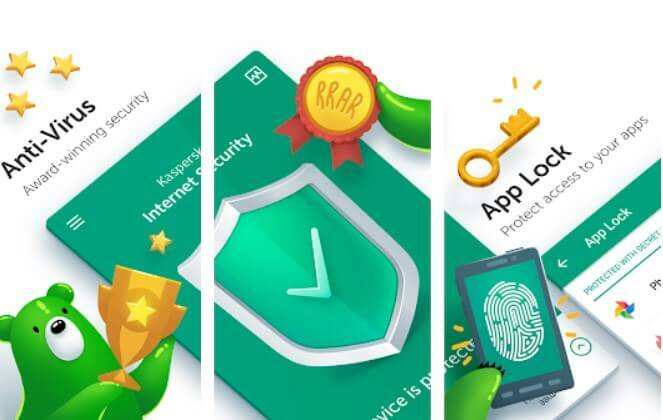 AVG is considered the best free antivirus for android as it provides comprehensive protection from all kinds of malware, viruses, data loss, and spyware. It has the ability to check for security threats and detect problems in the settings of your android device. 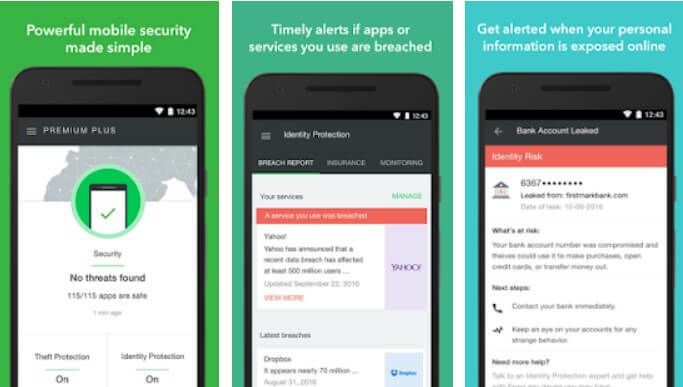 Although the free version has much to offer, the paid version also offers premium features such as SIM locking, app locking, and app backup to keep your device safe and secure. Avast is another antivirus that is available for both computers and Android devices. The mobile version offers advanced security features that protect your phone from malware, spyware, Trojans, or unwanted calls and texts. You can always start with the free version before upgrading to the paid version. 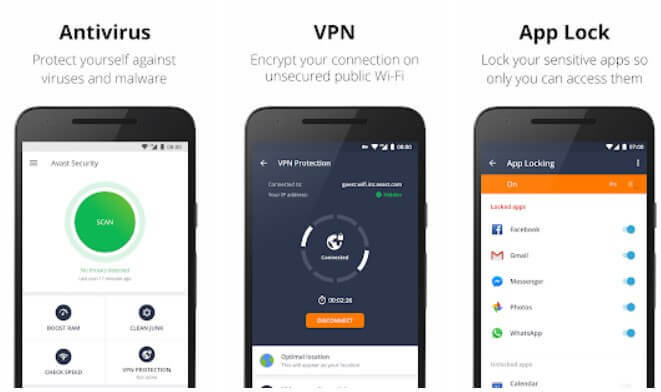 The most interesting feature about Avast Mobile Security is that it performs automatic scans for viruses on memory card content, existing apps and while installing new apps. It supports the firewall features which makes it useful for the rooted users. If you want to enjoy the premium features, then you should consider making monthly or yearly payments to stay protected. Malwarebytes is one of the most popular anti-malware technologies that are used on computers. 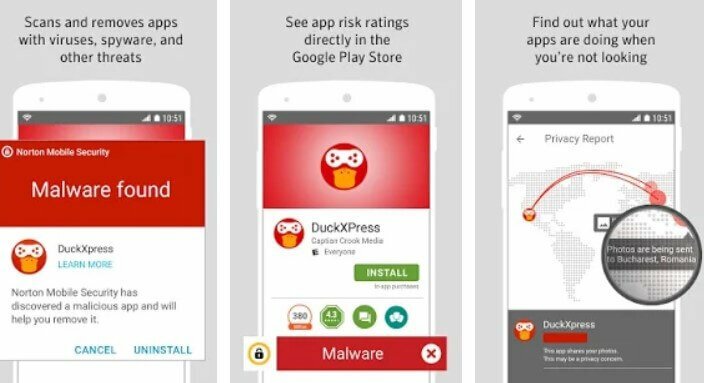 It was also designed as an antivirus app for android and it focuses primarily on destroying any kind of malware, Trojans or spyware in your smartphone. Malwarebytes can easily detect potentially unwanted programs (PUPs) and comes with a built-in privacy that keeps your personal data safe from unauthorized parties. Its application manager gives you access to view permissions of every app on your android device and also determine the apps that are currently running. 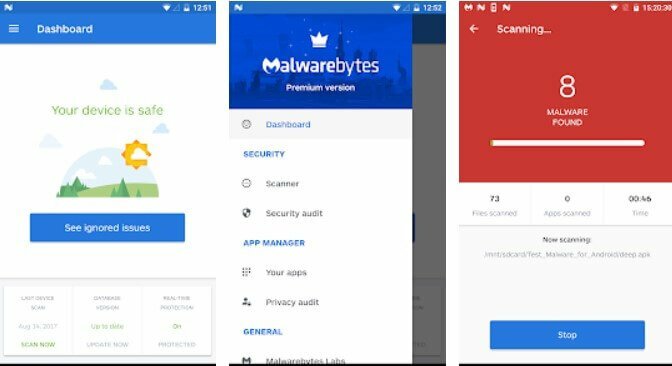 Malwarebytes can detect any app that is trying to access your personal data or an app that uses malicious coding. 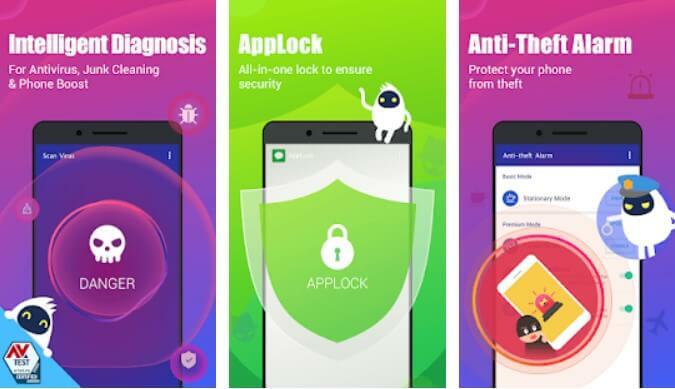 If you are always worried about losing your phone, then you should consider installing the Lookout security and antivirus app from Google Play Store. As the name suggests, this app allows for remotely locating your android device in an event where it is stolen or you happen to lose it along the way. With Lookout Security app, you can easily control your lost device to keep your personal data safe and secure. It also offers virus scanning and continuous protection making it the best antivirus for android. You can also upgrade to the paid version as it offers advanced premium features such as theft alerts and Breach Report. Anti-theft, anti-virus, remote control, real-time protection, app scanning, and back up features. If you have been looking for the best free antivirus for android then 360 Security will be the best pick for you. It offers an all-in-one solution as it comes packed with useful and advanced features that help protect your phone from potential viruses and malicious threats. It is possible to monitor every new APK installation the fact that 360 Security offers you a real-time protection. All you need to do is to configure it with only a single tap. It is a fully featured app that can be downloaded in Google Play Store for free. TrustGo is a popular security app that provides ample mobile security and protection from adware, spyware, and viruses. 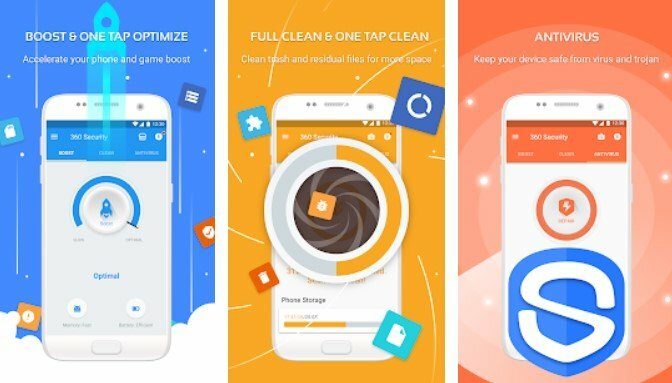 It has also received a high rating on Google Play Store as it brings unique features that are much better than most antivirus apps. TrustGo allows you to safely browse the internet without having to worry about any malicious links or websites. Its regular scans for malware are pretty fast and can detect infected files and apps within a few seconds. The cool candid camera thief ID is probably the most interesting feature about this security app as it can take photos of people who try to unlock your private files. ESET is also a popular brand behind the NOD32 Antivirus used on Window PCs. It is quite fortunate that they also made an incredible antivirus app for Android devices. 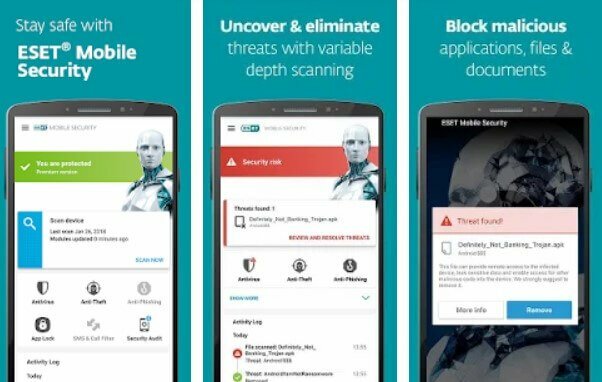 The ESET Mobile Security and Antivirus boast a 99.7 % rate of virus detection. It comes in both free and paid versions. It is always advisable to start with the free version if you want to gain a user experience on ESET Mobile Security. However, the paid version comes with premium features such as SMS and call blocking, mobile security education, and phone finder. ESET mobile security gives you free access to the premium features for the first 30 days. 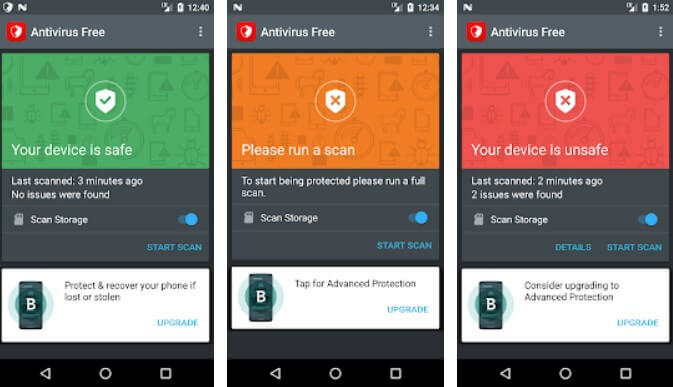 This is one of the best antivirus for android, Norton Security app has been around for a long time as it saw the advancement in technology on Android devices over the past years. It is an all-in-one security app which means that it can lock the stolen device remotely and comes packed with other features such as a virus scanner and removal. It has the ability to protect your device from privacy intrusion, spyware, malware, theft, viruses, and unauthorized use. It has similar features to the Lookout Security and Antivirus app since it can locate a stolen Android device and even lock the phone remotely after several failed unlock attempts. McAfee is another best android antivirus that offers active protection to all Android devices. It boasts the TM technology that scans for malicious codes in download folders, SD card, and personal files. It also comes with many other features that work round the clock to provide security and keep your device safe from potential threats. If you don’t want any calls or SMS from contacts that are not allowed on your list, then McAfee will be of help as it blocks all calls and messages as authorized by the user. The 14-day trial version allows you to preview a few features about McAfee before purchasing the full version. DFNDR looks great on Android devices and comes with many free useful features. It is one of the best android antivirus apps that focus on speed, security, and performance. A prominent feature of DFNDR antivirus is the possibility of tracking your phone remotely. 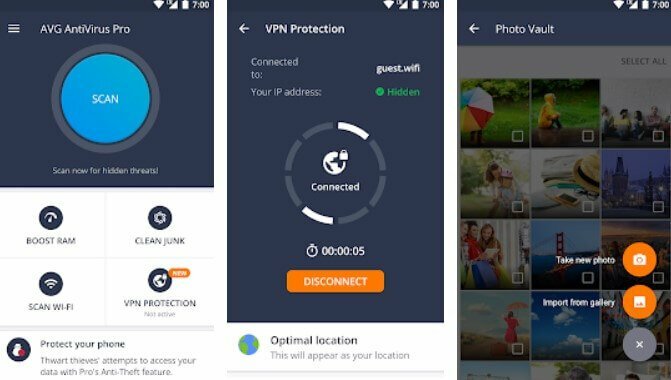 If you want to catch someone who has been spying on you all the time, you might consider this antivirus app as it comes with the Intruder Selfie feature that takes a picture of the unauthorized user. The paid version removes the annoying ads of the free version and has more unique features for protection and privacy. 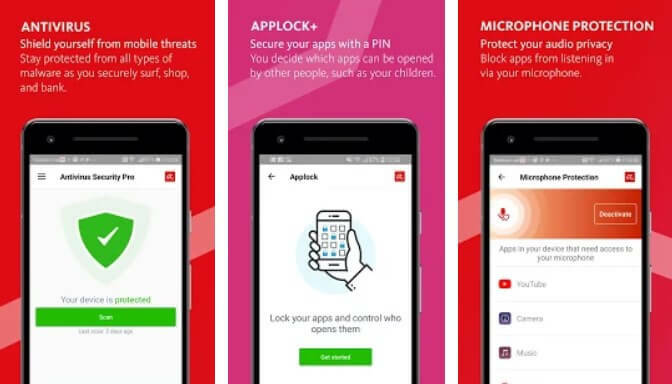 Avira Antivirus app for Android focuses on protecting the privacy and personal data of an android user. It also allows for tracking a lost or stolen phone while preventing access to text messages, e-mails, and photos. Avira offers a comprehensive solution when it comes to safeguarding the privacy of users. The advanced virus scanner is not something to be overlooked as it can detect different types of malware, viruses, and spyware. The settings that come with premium features can be configured for protection against privacy instruction and theft. 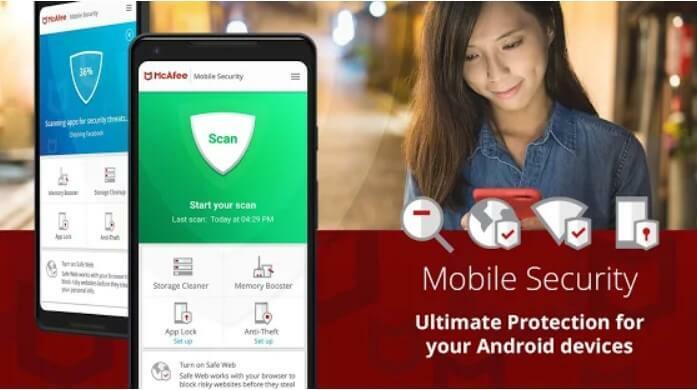 Avira Security is one of the best Android Antivirus for those who want an all-around protection against malicious sites and other potential threats. Go Security is another great selection of the Go apps. People who have been using Android smartphones for a long time are probably familiar with the Go Keyboard. The Go Dev Team have done their best to come up with the Go Security as it offers the best protection from malware, viruses, and invasion of your privacy. According to the developers, Go Security app is much faster than other antivirus apps when it comes to detecting new viruses. This makes it one of the leading virus detection engines on the list bearing in mind that privacy and security are the most essential factors to consider when using an android device. Choosing the best antivirus for android should not be a difficult task for you since most of them offer unique features that guarantee enough security and privacy. It is also advisable to download these apps from the Google PlayStore to avoid installing infected apps from unknown sources which claim to work better than other antiviruses. Even if you don’t download apps and other media files very often, accessing plenty of sites may direct you to unsecure web pages. It is important to download the best android antivirus if you want to keep your Android device safe from malware and other viruses that can be downloaded from malicious websites. Images Source: Google Play Store, All rights and reserves are associated with original uploaders.